now, i'm not a fan of baked beans, to the point of practically fainting when i see them (i'd love to find out why...some terrible childhood trauma that i've pushed to furthest corner of my mind, i'm sure) but i am a fan of frank's little baked bean people. 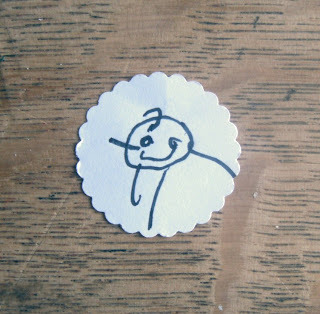 (so called by me because of his inability to realise people have heads and bodies) this evening, while i was washing up, i was presented with this teeny tiny person with one single strand of hair, drawn on a little circle of paper. awww.